Last week we reported about the art project „The Tree Walker“, today we present an interview with Christoph Both-Asmus. During our Skype-conversation Christoph was sitting on a small patio of his apartment in Greece. Being there as an artist in residence, he prepared himself for his performance „One life to live“, to initiate a dialogue about art in public spaces with the people. In the interview he tells us whether or not he sometimes dreams of treehouses. Treehouses in general stand for a change of perspective. And when I see the Tree Walker project, it stands for many things. But especially for free thinking and imagination. You are just at a different place and have a different view from there. And you are directly connected with a living being. So I personally would like to build my treehouse in a way that the tree can grow on and on. Yes. Growing up there was a snobbish new building with a treehouse for kids. It looked like one from a hardware store, was never used and I somehow did not like it at all. As a kid I then hammered together a platform of boards out of rotten planks and carpenter nails I found in the basement. For me that just was a possibility to sit on a tree. 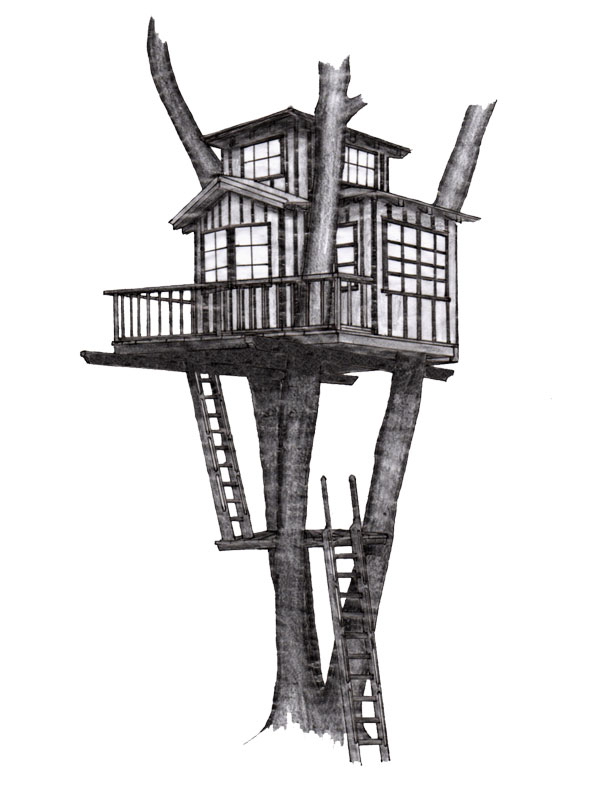 But the whole treehouse with roof and all the other stuff just existed in my imagination. When it comes to treehouses for kids I still think it is important not to predefine too much. Here less is absolutely more. What does you perfect treehouse look like? The realisation of the picture of „The Tree Walker“ – the walking across the Moabi-trees in Gabon – to me is very important. I spent several nights on trees under the stars and I wonder what it is going to be like on top of the rainforest in Gabon. It has to be a little comfortable, you have to be able to lean back a little. For example this platform, on which you can sit. I like when you can stay there for a longer period and feel the tree. Can you imagine to live in a treehouse? Absolutely! In Germany it isn’t easy to get permits for a treehouse, isn’t it? As a matter of fact my wife and me we are looking for a new residence somewhere close to Berlin. But I would rather like to buy a piece of land, reforest it and then build a treehouse and live in it. Which book would you recommend as treehouse reading? There is a book called „The Global Canopy Handbook“ written by my partners. They are the very first scientists who collected all the knowledge from altitude research, climbing techniques and so on to ascend into the highest treetops. What would you serve me in your treehouse? What kind of trees do you like the most? I like crooked pines growing on mountain slopes a lot but also the whole rainforest vegetation. Who would you like to take up to the treetops with you? On the one hand I’m in favour of undiscovered parts of the world to stay undiscovered. On the other hand I’m entering unknown no man’s land with „The Tree Walker“. I think parts of untouched rainforest should stay untouched. I see my job as an artist in making this unprotected landscape tangible and visible for others. We all know that we can only really absorb a picture when there is a person visible on it. May it be because you identify with the person or you can’t see the relations until then. For after it I wish that the landscape stays one of those untouched, prehistoric and timeless places. 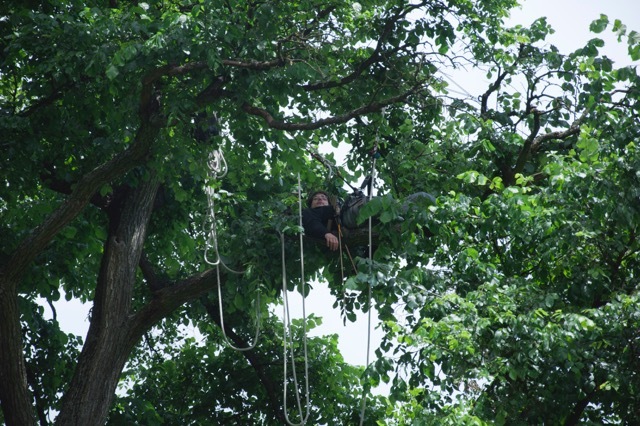 When I think of the „The Tree Walker“ project, a visit in the trees could give something to all people, as long as they really engage with the tree and respect this different form of life.